Although roasted root vegetables are commonplace in my kitchen, I had never before embarked on roasting a beet. I thought I was content with my 69 cent canned pickled version, but a homemade roasted beet proved me wrong! Boasting an exquisite deep purple color and bursting with flavor, warm out-of-the-oven roasted beets are a wonderful treat this time of season and yield so much more flavor than their store-bought counterpart. Straight from the Kilpatrick Family Farm and CSA- and I recommend you get your beets at a local farmers market- this Roasted Beets with Dill-Walnut Vinaigrette recipe pairs the tender sugary root vegetable with toasted walnuts and a fresh dill and shallot dressing. Red wine vinegar and lemon contribute some acidity to the dish, which when tossed and served immediately is refreshing, sweet and tangy all at the same time. Feel free to top off your salad with a big dollop of Greek yogurt for some filling protein and color contrast. Three years ago, the New York Times wrote an article posing the question Are beets the new spinach? Like spinach, beets can be considered a "nutritional powerhouse" with their significant source of folate, potassium and vitamin C. Beetroots' greens only add to the nutritional mix by containing high concentrations of beta-carotene, soluble and insoluble fiber, and calcium. According to the American Heart Association, drinking beet juice can lower blood pressure too. 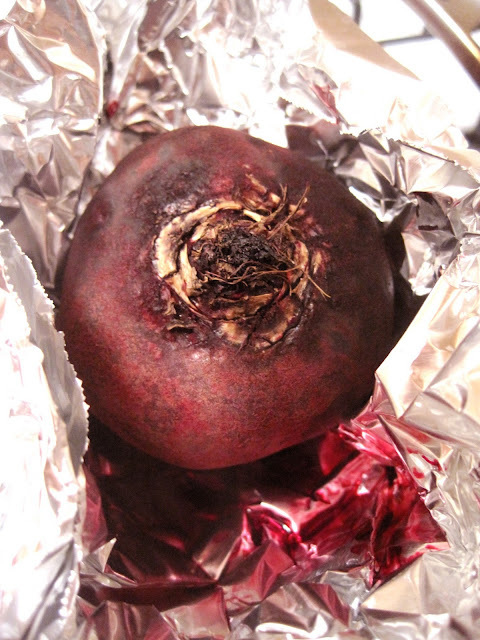 Roast beets, wrap beets individually in tinfoil or parchment paper . Place in shallow roasting pan, and place in a pre-heated 400 degree oven. Roast until skewer inserted into a beet comes out easily, 45 minutes to an hour. Place walnuts in a skillet and toast over medium heat stirring frequently, until they become fragrant, about four minutes. Whisk the vinegar, lemon juice, shallot, dill, and oil together in a small bowl until thoroughly combined. Add salt and pepper to taste. 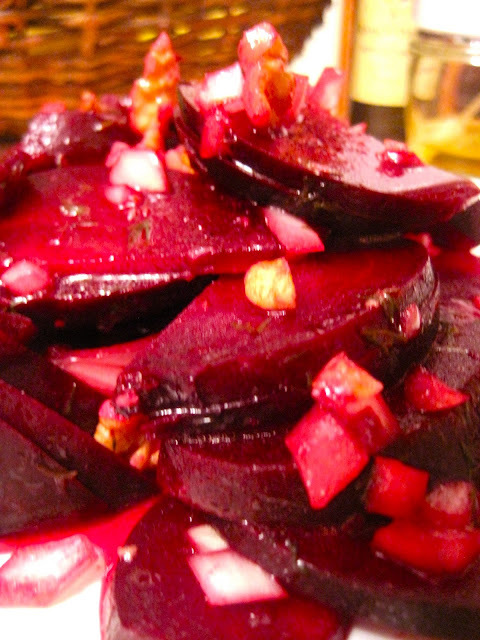 Toss the dressing, sliced or chopped beets, an walnuts together in a medium bowl. Serve immediately. Shulman, Martha R. "Beets: The New Spinach." The New York Times 4 Aug. 2008. The New York Times. Web. 5 Dec. 2011. <http://www.nytimes.com/2008/08/04/health/nutrition/04recipehealth.html?ref=fitnessandnutrition>. "Specialty Crops: Beets." Sustainable Farming Project. Tufts University. Web. 5 Dec. 2011. <http://nesfp.nutrition.tufts.edu/ethnic_crops/vegetable_details.php?veggieid=9>. Dill is my favorite herb. It makes everything better. Great healthy post!